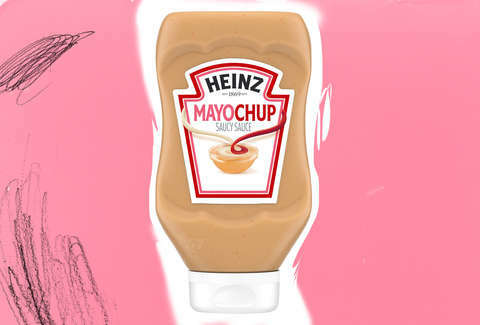 You probably remember back in April when Heinz began threatening America with the release of Mayochup -- the unholy yet seductive fusion of mayo and ketchup. Heinz finally left the decision of whether to release Mayochup up to the public with a Twitter poll, just like Pontius Pilate, and washed its hands of the matter. So Mayochup is coming to stores all across the United States. The only question is where it'll head first. Heinz has launched yet another Twitter poll to decide where the condiment will make its debut: Culver City, California; Chicago, Illinois; or Brooklyn, New York. You can also nominate your own city. Vote for your city (or another city to keep it away from you) by Tuesday, September 18 at 11:59pm CST. The dread condiment will then become available nationwide later this month and will be sold at the likes of Amazon and Walmart in 16-ounce squeeze bottles at a suggested retail price of $3.49. It isn't a limited-release product either. This is an official member of the Heinz family. So, however you feel about this product, remember you have no one but the 500,000 of you who voted to bring it to America to blame. For the record though, Mayochup is actually pretty good.